Recently, Hurricane Harvey and Hurricane Irma have devastated and affected many, leaving a trail of destruction in large areas. Whether it is hurricanes, thunderstorms or tornadoes, natural disasters provide a stark reminder of our vulnerability and that we should always be prepared. September is National Preparedness Month and this year’s theme is “Disasters Don’t Plan Ahead. You Can.” Each week throughout the month focuses on a different theme, all helping to emphasize preparedness among everyone including youth, older adults, and people with disabilities and others with access and functional needs. The best way to combat the unpredictability of natural disasters and emergencies is to plan ahead. Here are some helpful tips to help get you started. Visit www.ready.gov for more information on what to expect, how to make a disaster kit and how to prepare and plan ahead for disasters. Many emergencies can happen anywhere, such as power outages or disease outbreaks. But certain disasters are more likely in some places than others. For example, in California, earthquakes are more common than tornados or tropical storms. Understand which types of natural disasters are common for your area and begin preparing for those accordingly. It is recommended that you understand the local mass warning systems that officials will use to inform the public of extreme weather conditions. Commonly used are the National Weather Service and the U.S. Geological Survey. Know how to receive information from these agencies and prepare a backup way of receiving this information in case your primary system goes down. You should also know where evacuation points are located in the event you cannot get home or your current location becomes unsafe. 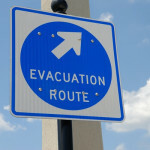 Know what circumstances would require evacuation and when to shelter in place. Keep it practical and tailored to disasters you are most likely to encounter. Take what we have previously mentioned and discus it with your family. Go over different disaster scenarios and what the family plan is for each one. Things like whether it occurs on a weekday or weekend and if children are at school should all be considered while planning. Making a disaster kit is the next step. You should include supplies necessary for a three-day period (the estimated time it might take to clear roads, restore power and have emergency crews reach people). After a disaster, emergency responders will address critical needs first and might not be able to get to everyone right away. A disaster kit will allow you to take care of yourself, your family, and possibly others, freeing up emergency responders to focus on the critically injured and restoring infrastructure. Creating multiple kits and storing them in different locations (car, office, home) is suggested – you never know where you will be when disaster strikes. You can participate in America’s PrepareAthon! – a nationwide campaign to increase community preparedness and resilience. Share your own preparedness tips with us on Facebook, Google+, Twitter, LinkedIn, and Pinterest. Visit SecurityCamExpert.com to browse our stock of CCTV security cameras and systems to keep an eye on your properties.